Sooooooo we found out that our stuff is not going to be here anytime soon. Even though it was packed up weeks ago, it is still sitting in Los Angeles and should be arriving here in approximately 33 days. That's over a month, y'all. I miss cooking, my pillow, cold a/c, and s-p-a-c-e. In other news, I handed over my Texas Drivers License and got this bad boy instead. Kinda makes me sad. 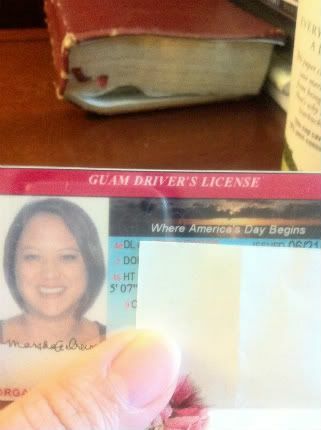 Moving all the way to Guam was not that big a deal to me, and yet handing over my Texas license was... Why is that?! I thought about lying about my weight on the application. Hotel living and eating out all the time is not conducive to rejoicing on the scale. I would totally have lied had I known they were actually going to print my exact weight on the front of my license! Please tell me my library card won't be as painful to look at. Let's move along now, shall we? 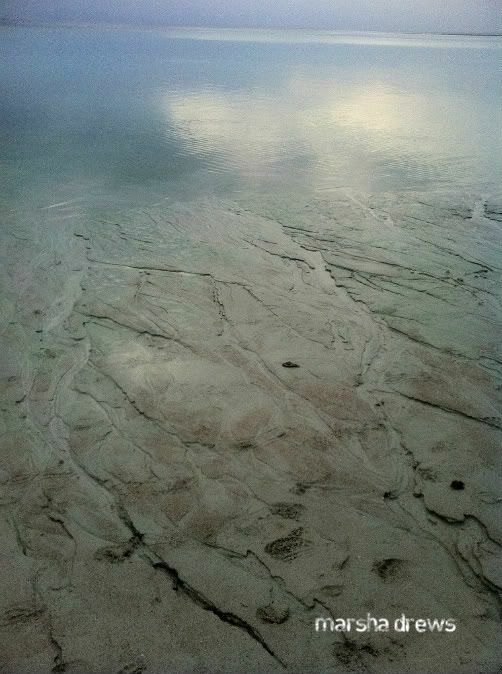 The tide has been very low and the waters very calm this past week. Peaceful walks on the beach were just what we needed after being in the hotel all day. No matter how clear the sky, it never takes long for a storm to brew, empty itself and then stop as suddenly as it came. 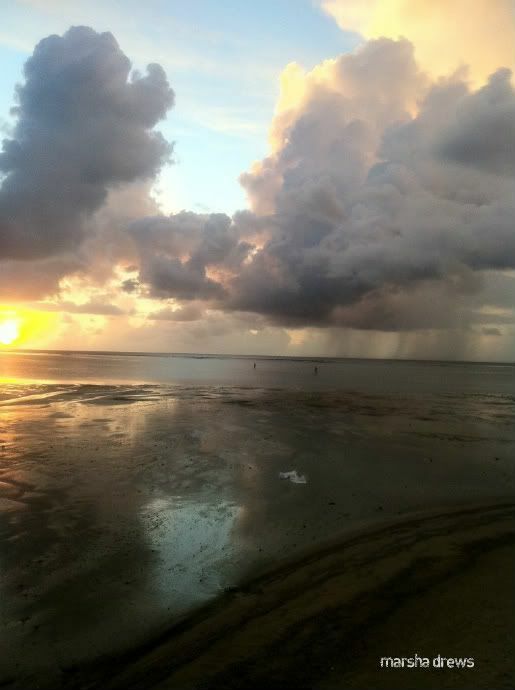 Guam has a small town (but tropical) feel and a population of approximately 160,000. Very opposite of Houston! 1. It has a Dairy Queen. 2. They have one traffic light. No Dairy Queen here and there are definitely a lot of traffic lights, but let's consider the fact that there is only one underpass/overpass on the entire island. That tells me it is definitely the opposite of big, overcrowded Houston here... and I like it that way. Would you lie about your weight if it was on the front of your drivers license? What's the population of your town? Do you think it is too big, too small, or just right? PS All of the [parentheses] and blockquotes in this post are bugging me... too tired to fix it. No one else has notices, yes? Oh girl... you are gorgeous! So is the landscape. I'm sorry to hear about your stuff though. 33 days? Yikes. You should have put the coffee pot in your carry on. Ugh on the stuff....ARE you SURE you guys aren't in the Military? LOL! Sounds like stuff that happens to us. I was VERY attached to my TN license and cried when I let it go. (That was just a few months ago, and we haven't lived there in 5 years). I lied about my weight when I went to renew. The guy was like, "Is it CLOSE to the original"...well, everything is relative, so I said, "Sure." and having your own house will be great, so enjoy not having to clean for 1 month. Enjoy not having a sink to scrub and carpets to vaccuum. I could not knowingly lie about my weight, but since I am opposed to weighing...I never know exactly what it is. Let's just say my estimate would involve ROUNDING DOWN. Something my bottom knows nothing about. Beautiful pictures!! What a gorgeous place you're living in. I HAD to laugh when you said moving to Guam was easy, but giving up your Texas license wasn't. *Totally* relate. When I got my Korean license I actually had to choke back tears. Silly, I know. But I'm also glad to know (even if it's way past my situation) that I am not alone in that feeling. I always felt it was the small things that were hardest to let go of. Hope their ETA of your things is wrong and you can be settled soon. Are you waiting for your stuff before you move into an apartment? Since our family recently moved across the country, I can totally relate. I am so glad to finally be settling in. Yep, it was HARD to give up my license. And YES I had to give my weight, I paused before I told the lady at the DMV. At least you have the beach. S.I.G.H. Our ciy has 37,000 and I think it's just about right, since I live on the edge and not in the middle of town. Otherwise, I might not feel that way. And no, I didn't really think the parenthesis were all that excessive (I do it all the time!). oh i'm sorry about your stuff! 33 days is a long time. no stop lights here. no dairy queen. no post office. i may live in guam. Would I lie about my weight...Yes I know this for a fact because I lied about it when it wasn't being printed on my license. When I was getting it renewed (from like 3 kids back) the woman asked me if I still weighed ###. "Uh, yeah sure whatever you say." My city pop is about 120,000 I love my city! Just right! WOW your license looks like a print-out for peah LOL! Great DL photo though! LOVE your new haircut! I'm SO envious of your beach view!!!! It is so pretty there! I don't have to lie on my driver's license because they don't really update it. When I had to renew it on my 30th birthday I opted to renew it online which meant they just sent me a new copy of my old license with a new expiration day. I get to look like and weigh what I did when I was 25 (and had only been pregnant once) until I'm 35!!! Yay! This made me laugh so hard. I would pretty much DIE if my weight was on my licence. OH MY GOSH!